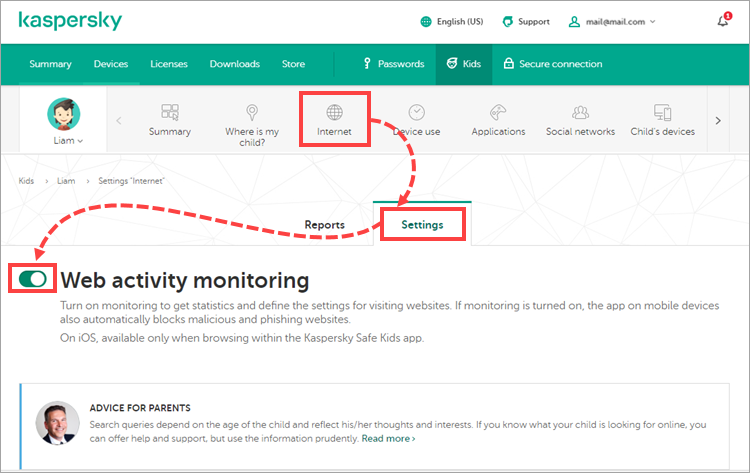 Kaspersky Safe Kids automatically adjusts settings according to the age in the child’s account. Summary, where you can view the activity on the child’s device for 1, 7, or 30 days. Where is my child? You can view the location of your child and set the allowed area. See this article for instructions. Internet, where you can view the statistics on visited sites according to the content categories. On iOS devices, these features are only available for the built-in Kaspersky Safe Kids browser. Device use, where you can find reports on the time spent using the device and adjust the time settings. Due to operating system restrictions, it is not possible to block children's iOS devices. Applications, where you can view the statistics of the application use and adjust the application use settings. These features are unavailable on iOS devices. Social networks, where you can see the statistics on social networks and adjust the monitoring settings. Child’s devices, where you can view the list of the devices used by children. Profile, where you can view and adjust the account settings for your child. This feature are unavailable on iOS devices. Make sure that Application monitoring is enabled. Click on the child’s device. Restricted to limit the access to the game to set period per day. Forbidden to block access to the game. Make sure that Web activity monitoring is enabled. Warning, if you want the application to show a warning when the child opens the website. Access will not be blocked. 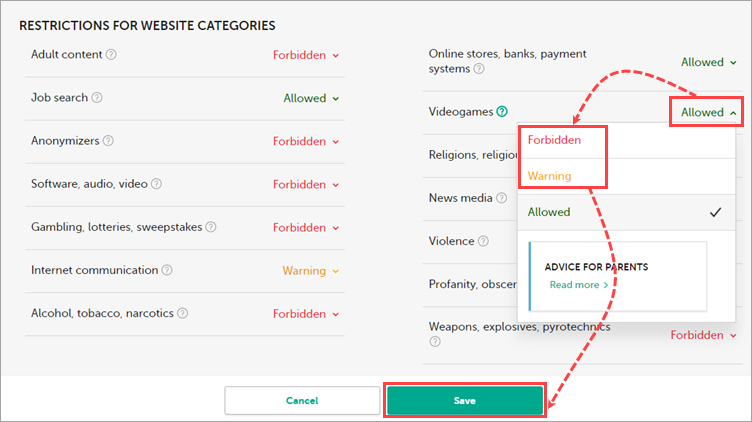 Forbidden, to block access to the website. Access to the games has been limited. Select types of notifications and the scope of notifications you want to receive using switches. Run Kaspersky Safe Kids on a parent’s device (Android device used in the example). Enter the Kaspersky Safe Kids access code or use your fingerprint. Go to Additional → Alert Settings. The notification settings have been changed. Click Device use → Settings. Make sure that Device use is enabled. Find the child’s device, click the down arrow and select Time limit. Warn by daily usage. The app will show a notification when the allowed period of device use ends. Block by daily usage. The device will be blocked when the allowed period of the device use ends. Only calls will be available. Text messages will not be available. The child will be able to view the call log and use the list of contacts and the home screen. Warn by schedule. The app will show a notification when the allowed period of device use ends. Block by schedule. The device will be blocked when the allowed period of the device use ends. Only calls will be available. Text messages will not be available. The child will be able to view the call log and use the list of contacts and the home screen. You cannot block your child’s device if it is running iOS. Set the schedule or select how many hours per day your child can use the device. Block device. 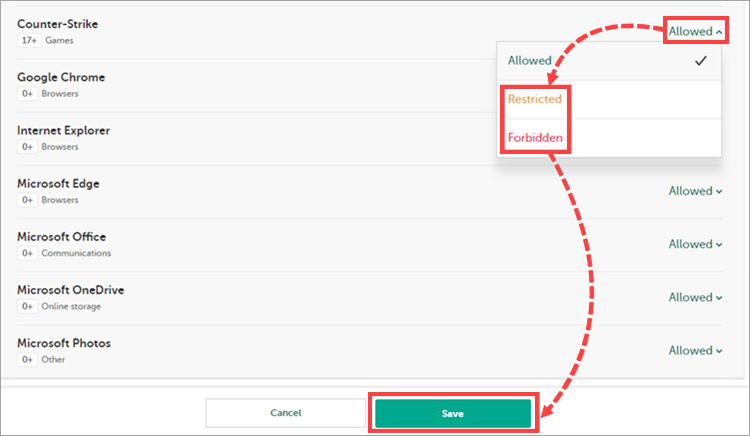 The device will be blocked when the allowed period of the device use ends. Only calls will be available. Text messages will not be available. Show warnings to child. The app will show a notification when the allowed period of device use ends. Tap Add days & hours. Device use limitations have been set up. Edit the profile and click Save. To delete the profile, click Delete profile under the editing block. The devices with the enabled child profile will be displayed. The report shows the information about blocked apps. The report will be shown. To save the statistics to a file, click Export summary to a file in the lower-right corner under the report block. If you experience any difficulties using Kaspersky Safe Kids, submit a request to technical support via My Kaspersky.